Ben Affleck, Alan Arkin, Viktor Garber. Six Americans escaped from the embassy in 1979 at the start of the hostage crisis, getting refuge from the Canadian ambassador. 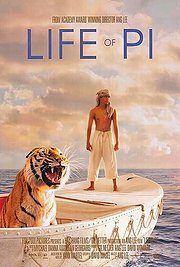 This movie focuses on the American ruse used to get them out. She says: We saw this late, so I was looking out for a diminishment of the Canadian role in this, anticipating the tension of watching the actual escape, though we all know it succeeded. I found the Canadian treatment not as bad as it might have been; it was at least clear the ambassador and his wife were putting themselves at risk in this venture. And the series of check points on the way out of Iran did, indeed, quite effectively build tension. And it is a really interesting story, that I hadn’t known before, that a faux movie was the pretext used for them being there (as Canadians), and that the American involvement was long covered up for the sake of the remaining hostages. While I’m sure the facts were “Hollywood-ized”, it’s still good to know them. 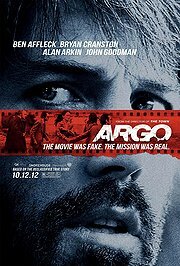 Unlike the fake Argo, this Argo was a well-made movie. He says: It kind of got on my nerves that every point of the escape was a cliffhanger, down to the plane being chased. But I couldn’t help get caught up in it anyway. And I agree that the Canadian treatment didn’t seem that bad.